General tactics and list building for the Rebel Alliance. This article is intended as an entry point to critical thinking about list building for Rebels and is not hard and fast rules. You are encouraged to build and play your own lists in your own way. The forces of the Rebellion are as numerous and varied as the planets they fight for. They can play in many different ways towards many different ends - but they are all built out of the same blocks and on the same principles. Quantity: "Make ten men feel like one hundred" - The forces of the rebellion are often rag tag operations built out of anyone who will volunteer - the good news is that there are a lot of volunteers. Rebel units tend to be quite affordable, and because of this you can get a lot of chaff to front load your turn with, saving your important units until later in the round when the opponent is unlikely to have any activations left to retaliate against your key units. Statistical Spikes: "Never tell me the odds" - Rebel forces dont have the consistency of their counterparts, however they tend to have much higher variance. The DLT-19 for example is likely to put out 2 damage but it will never put out more than 2 damage, the Z-6 on the other had is also likely to put out 2 damage, but can spike as high as 6! That makes rebels sort of unpredictable, you can't always count on the outcomes or choose when or where you get your big rolls, however over the course of a game you can expect your output to average higher than your counterparts. Adaptability: "Rebellions are built on hope" Each tool in the Rebels arsenal is not purpose built, unlike their counterparts. Rebel units tend to be very adaptable to the needs put on them - Luke Skywalker for example is a melee unit but he has a really good gun on him too and is fast enough to change plans on the fly - unlike his counterpart Darth Vader who is essentially committed to melee and cannot change his plans once he's set them in motion due to his slow speed. However this also means that they are not a skilled as their primary function as their counterparts are. Synergy: "Help me, Obi-Wan Kenobi you are my only hope" Rebels units have a lot of synergy and codependence amongst each other to play optimally. Rebel Troopers rely on Leia's ability or Lukes command cards to give them dodge tokens. Han and Chewie share their tokens and help protect those around them. If you are able to get all your synergies working together the strength of the Rebels really shines, but if you start losing links in the combo chains too early it starts to become an uphill battle. Each unit in the Rebellion is a dynamic and adaptable piece, often working in concert with other pieces to become more than the sum of their parts - and Rebel lists tend to follow this guiding principal overall. Rebel lists are built around unit interactions and synergy - usually a character or support unit that feeds into their troops who do the bulk of the work. The can be something as direct and blatant as Leia's Take Cover ability or the many command cards that greatly enhance certain interactions, but it can also be something as subtle as a T-47 distracting the enemy long enough for your Fleet Troopers to get into place - the important part is that the units work together to improve the other units around them. When you begin building a Rebel list it is best to start with your synergies and combos - when deciding it is best to pick them in pairs or to start with the unit that will end up doing the work, building the other way around tends to leave you with too many buffs and not enough actual work getting done. Generally the synergy will start with your commanders or operatives, but in the future this could also be support units, upgrades, or other specialized forces. It is wise to keep the support pieces as lean and as focused as possible. It may be tempting to add upgrades to them to make them more versatile or to keep it alive longer, but in most cases you can protect them with play-style and can better spend those points elsewhere - it would be a better use of resources to add more work units rather than to over upgrade or add too many support units - as a general guideline your support should never cost more than 1/3 of your list or 250 points. Once you have chosen you synergy combos it is important to know their timing and limitations. 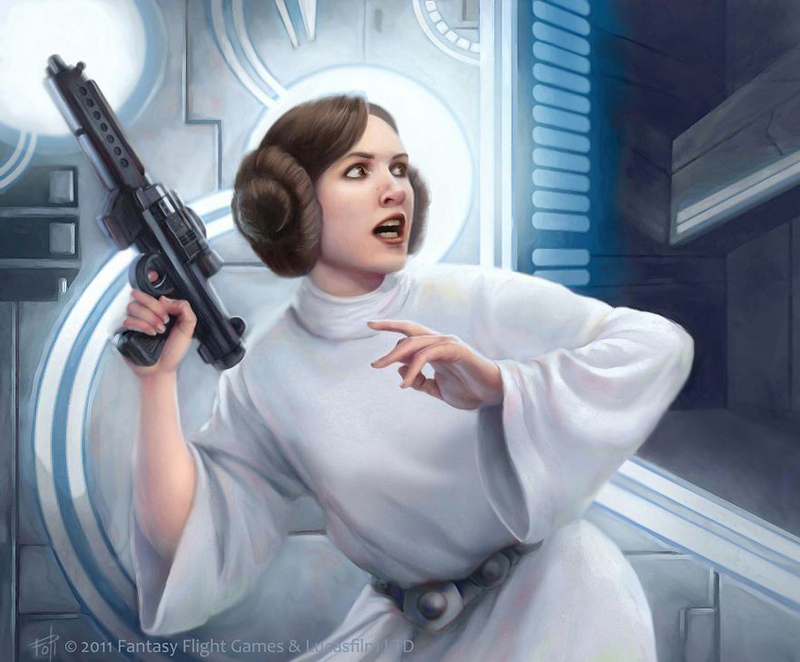 Leia for example can hand out two dodge tokens and remove suppression so it is important she activates early in the turn and before her buff targets move out of range. Chewie supports Han quite well and will always want to be near him, although how you use him could change depending on the card Han uses. Luke tends to do most of his support through command cards and so will want to make sure he is within range 3 of your troops. Once you have identified your synergy combos purpose, timing, and limits its time to flesh out the rest of the list. Now that you have your synergy combos chosen it is time to build the rest of your list - there are two paths you can take from here and knowing which one to take requires you to know your personal playstyle and preferences. In a skew list you double down on the functions of your synergies - the general tactic and theory here is that an enemy list will have limited answers to the problem they are presented with. A skew list will present a very limited number of problems but in a quantity or quality of them will overwhelm the toolsets of most lists that encounter it. For example if you are playing with Han and Chewie your opponent likely has a toolset that can handle two models that deal moderate damage and are hard to remove. a skew from there would be adding Leia, Esteemed Leader, and some Emergency Stims - although the opponent's toolset could deal with Han and Chewie together, it is unlikely to be able to deal with them now that they have some regeneration and an astronomical number of dodge tokens on them. As a second example, most opponents lists will have the tools required to handle Fleet Troopers, however when you run Fleet Troopers alongside Flamethrower AT-RTs you are now starting to skew. At some point most lists will run out of tools to stop both sets of units before they reach their targets, at which point you are able to deal a massive amount of damage at close range. A Rebel skew will often also play off of the very powerful rebel command cards and maximizing their effects, for this reason comms and especially HQ Uplink play very strongly into Rebel skew - for example HQ Uplink when combined with No Time for Sorrows can give a huge portion of your forces a free move out of turn or when combined with My Ally is the Force can cover your forces in dodge tokens. In general Rebel skew lists are a bit more difficult to run because they require more mastery over positioning and timing than an average list - but once they hit the threshold of overwhelming the opponents list they encounter little resistance. Because skew list are so hyper focused in their function they tend to have large weaknesses themselves and sometimes get asked a question that they cannot answer - because of this although they can do well in competition they often are not considered top tier competitive because they rely on the luck of not encountering their weakness and are easy to overcome for opponents who happen to have an answer to the skews question. Balanced lists are the opposite of skew lists. In a balanced list you look at what your synergy combos do and then instead of doubling down on them you build around it in a way that supports it, but also covers its weaknesses and shortcomings. Generally balanced lists have a broad toolset that can answer many question it is presented with, but may not overwhelm some opponents the way a skew list will. Balanced lists can still be overwhelmed by skew lists, but in general have a much more consistent and predictable win record when piloted with skill - and therefore tend to be considered more competitive. To use our previous examples If you had chosen Han and Chewie as your combo instead of skewing into Leia to generate more tokens on them a balanced list would likely include Luke. Luke adds speed and melee capabilities to the list and does not need to be near Han and Chewie to be contributing to the fight. When taking an Fleet Troopers instead of skewing into Flamethrower AT-RTs a balanced list would take Laser Canon AT-RTs who can support the fight from a great distance away and deal with armor while the troopers focus on other troopers. Another iteration of the Rebel balanced lists is the reverse of a combo skew - or in other words, when a skew list doubles down on one specific interaction a balanced inverse of that would take multiple elements that you can swap in and out of that scenario so that you can adapt to what you need when you need it. An example of this would be taking Leia with Han, Chewie, and two units of Rebel Troopers - in this example you can either put the tokens on Han and Chewie and give them tons of tokens, or put on on them and one on Leia, or both on the Rebel Troopers - the key is adaptability and a broad tool set you can change as needed during the game. Crafting a balanced list also takes considerable skill, forethought, and knowledge of the meta to know what questions are likely to be asked and what answers them. However once you find the right balance for your style and the meta, playing a balanced list is often the most enjoyable and rewarding. Once you have chosen your synergies and decided on whether you are building into a skewed or a balanced list, the next step is to envision how all of these elements come together in the ideal situation. Is this list designed to table the opponent? Does it turtle and play at range? Is it focused on the scenario? What mission parameters does it want to see? does it not want to see? Does it want to be Red player or Blue player? If you are playing a skew list you should figure out what the question is you are asking; “can you overcome heroes that are buried in dodge tokens?”, “can you catch all my units who are moving unpredictably?”, “can you survive a swarm of short range high damage units?”, etc. In addition you should figure out what your weaknesses are and what questions you have trouble answering, and if you can adapt your playstyle to help mitigate your own weaknesses. If you are playing a balanced list in addition to the above questions you should also know what role each unit plays, how many different ways your synergies can be applied, what questions it answers, and if there are any unconventional uses for it that increase your toolset. The Rebel Super Friends list tends to be more of a skew list focusing on bringing as many commanders and operatives as possible and then maximizing their command cards and abilities to make the heroes as hard to deal with as possible. Because this list tends to be very action heavy it is a bit on the slow side, but tends to hold objectives very well. Often the non-hero units included will be more generalized to cover as many situations as possible that the heroes cannot. The skirmish list is more on the balanced side. It tends to take a small amount of heroes and then specialized units to handle specific roles. Rebel Commandos, Fleet Troopers, and Wookie Warriors are good examples of units that would show up in a skirmish list. Generally this list style wants to use some damage focused units to hit the opponent so that some of your back units can interact with the scenario and support the line of combat. Swarm is a popular style of Rebel skew and focuses on overwhelming numbers of activations. The general idea is to take a high volume of low impact units with a few high impact units, and then to out activate your opponent saving your high impact units for last so they can activate without the fear that the opponent can retaliate. This list style also does well at certain objectives that count on numbers to score points such as Breakthrough and Intercept the Transmissions, however this list has a weakness to attacks that can ignore cover or in other ways quickly and easily remove your less impactful units. Rebel Goodstuff tends to be a balanced list. This list style tends to take more independent units or smaller more self contained combos. Luke, AT-RT, T-47, and Han / Chewie are popular options in Rebel Goodstuff. The style is so broad and general though that it is hard to fully encapsulate. Once you have picked the elements of your list and crafted them together it is time to test your creation. The best way to do this is to play casual games with friends, if you are preparing for tournament competition then ask them to play lists that you think your list will do poorly against or problems that you think are likely to come up in the meta. There are some things to keep in mind however - You should complete a hand full of games before making any changes to your list no matter the results, this will give you a better idea as to whether the things you think aren't working really aren't working or if the last game was just a fluke. When you do make changes make small changes and then play several more games to retest - This will help give you an idea of how much of the list is working and how far from peak efficiency you are, often it doesn't take much and generally when making big changes you end up over correcting too far in the opposite direction. Lastly, and this takes a lot of skill, patience, and self-reflection; often when you built a list on paper that you feel really good about that list is good and fits your play style because it came from you. The biggest changes with the most beneficial impact are often not changes to the list at all but how you play it. To test changes in this way, try being more conservative or more aggressive with specific pieces, change what parts of the opponents list are priority to remove, or test different game paces and how you approach the scenario objective. Although you can build your list however you'd like there are some general guidelines to keep in mind about lists in general - both so that you know what you might face, but also if your list falls too far outside of this you know there may be issues. Activations: Most competitive lists contain between 7 and 10 activations - you can have significantly more or less than that, however keep in mind that too few activations means you generally can't put out enough attacks to handle your opponents units, and too many activations means that you are running small units who will have a hard time overcoming constants in the game such as dodge and cover. Initiative Bid: Depending on your list and play style you will under bid the amount of points you take. If your list and play style dictate that you prefer red player, then by all means get as close to the full 800 points as you can. However if you want blue player you will have to gamble on how many points you can pass up. Generally around 5-9 points is considered a normal bid for a list that wants blue player, at this level you are missing out on one or two upgrades that a player who wants red player will not have skipped over. around 10-15 points is considered a moderate bid, at this point you will edge out lists that aren't dying to be blue player but you also are giving up several upgrades that you may or may not have needed. 15-20 points is a pretty aggressive bid, at this level you could add a special weapon or extra trooper which could have significant impact on the course of the game. Bidding more than 20 points will almost always guarantee you blue player, but it is a significant sacrifice and should be considered quite a bit before committing to. Impact and Armor: Armor is a significant hurdle to overcome if you did not prepare for it. When building a competitive list you want to ensure that you have enough impact to handle any armor that you might encounter. A good guideline but not a hard fast rule is that you want to be able to put out 6 points of Impact at range per turn or 12 points of Impact up close. Generally this means 2 AT-RT with Laser Canon or 2 full units with Impact Grenades. Additionally you can counter vehicles with Ion weapons, as a general guideline 1 Ion weapon can replace half of your impact needs but it is best not to mix and match. Commit to an impact solution or an Ion solution to armor. Troops and objectives: The list building rules only obligate you to bring your commander and 3 corps units so you could in theory fill the rest of the list with vehicles - however you should keep in mind that the majority of scenarios can only be interacted with by troops. for this reason I recommend taking at least 4 full units in addition to your commander or 6 minimum units. This ensures that your opponent can't just wipe your troopers off the board and then keep you from contesting the scenario. It does not matter if those troops are corps or elite or whatever you'd like as long as they can interact with the objective. Now that you have completed the Rebel Recruitment you have the toolset to go forth and be a powerful commander - just keep in mind that these are guidelines and archetypes, you can and should build lists the way that makes sense to you. Often the best list you can play is the one you came up with yourself because it already meshes well with how you tend to think and play.